I stumbled across the work of Boston comic creator Doug DeRocher last week thanks to a YouTube video. He does comics using cut paper and the quick snippet of his work in the video intrigued me enough to look him up. 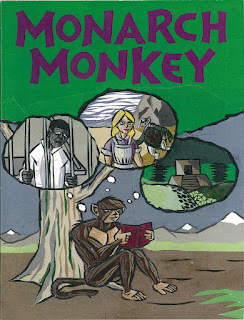 Over at his website, there are many examples of his work and I thought it looked pretty cool and worth it to pick up a copy of his book, Monarch Monkey. It's actually a collection of four short stories that he's had published in various places. The lead is "Monarch Monkey", which is a mostly wordless retelling of the origin of Sun Wukong, the Monkey King. Next is a non-fiction piece summarizing "The Boston Slave Riot and the Trial of Anthony Burns." Then is an adaptation from Alice's Adventures in Wonderland, excerpting the chat Alice has with the Mock Turtle and the Griffon. The book closes with a short tale covering the end of the Mayan civilization. I was initially attracted to DeRocher's work because of the cut paper aspect. While a number of comic artists have used collage techniques before, DeRoucher is the first I've seen to 'draw' with the cut bits of paper. Every line and shadow and highlight is an individual piece of paper, cut out with an X-acto. I believe I have seen this before in single piece illustrations, but never as a sequential art narrative. It makes for a fascinating visual and becomes more engrossing as you get deeper into the book, as DeRoucher arranged the stories in the order of when he created them. The Mayan piece is quite striking in many of the effects he achieves. I was next drawn to his subject matter. I'm a big fan of Alice and Monkey King stories in the first place, and I've done enough reading about the Mayan civilization to have my intrest piqued there as well. In all three cases, I though DeRoucher did a good job of interpretting the originals and presenting them in a succinct, but cohesive way. To be fair, Dan Mazer wrote the Alice adaptation and Hyun Supul wrote the Mayan piece, but the pacing and breakdowns were very well executed by DeRoucher. Mazur also wrote the Anthony Burns piece, a story which I was previously unfamiliar with. That held together well and I learned a thing or two about the legalities of slavery that I hadn't known before. You could cynically look at the cut paper style as just a gimmick to stand out, but I get a deep sense of sincerity here and that he genuinely enjoys doing comics in this way. I think that's what really impressed me as I went through the book. You can tell at a glance that DeRoucher is pretty talented when it comes to illustation, but that he did such a good job with the storytelling as well really made the work shine. That it improved as he went through really speaks to his ability as an artist. He's really put a ton of effort into not only each work, but his craft as a whole, and that is what really stands out to me. I was really impressed with the book overall, and I'm already eager to see more. I'd love to see him tackle the whole Monkey King story as a graphic novel. I think it'd particularly gorgeous once he got the character into his trademark (i.e. really colorful) outfit. But you know, I'm up for whatever he puts together next. If any of you folks out there happen to be comic publishers, give this guy a call now! 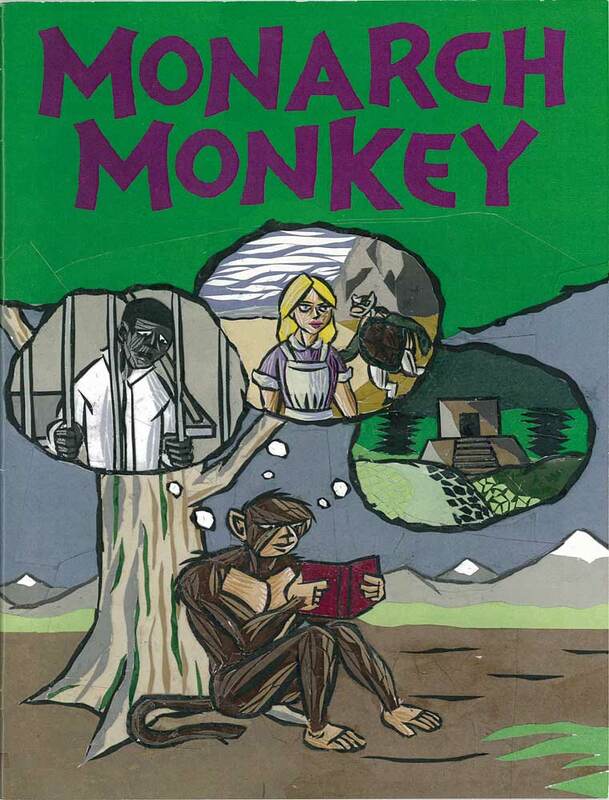 The 40-page Monarch Monkey is available for $6.50 + S&H here. DeRoucher sent my copy off very quickly and included a neat Monarch Monkey sketch to boot!